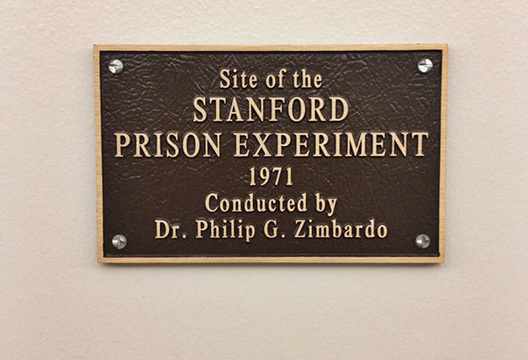 New evidence from the Zimbardo archives challenges everything you have taught (or been taught) about the Stanford Prison Experiment, argue Stephen Reicher, S. Alexander Haslam and Jay Van Bavel. We all know the story of the Stanford Prison Experiment. It has been a staple of introductory psychology textbooks and lectures for nearly fifty years (see Griggs, 2014). Ordinary young men were randomly divided into Prisoners and Guards; within a short time, the Guards become so brutal and the Prisoners so victimised that the study – originally scheduled for two weeks – had to be cut short after only five days. These findings seem to demonstrate the terrifying power of the situation over individuals. Philip Zimbardo has always insisted that he had to do nothing to produce such toxicity. The participants simply slipped ‘naturally’ – and perhaps unconsciously – into their roles as vicious guards or broken prisoners. But now, a half century later, dramatic new evidence has emerged that challenges Zimbardo’s account. Our textbooks and our lectures will have to be rewritten. The story of what happened in the SPE and why such brutality occurred will have to be retold. Over the years, several scholars had expressed doubt over Zimbardo’s version. But the problem was that much of what actually happened in the SPE remained opaque and so the story in the textbooks went unchanged. We knew that the study had been recorded but the recordings were not in the public domain. And since evidence from the SPE was never actually published in a peer-reviewed psychology journal, methodological details of the study were also not in the scientific domain. This all changed recently when both video and audio tapes were deposited in Zimbardo’s online archive at Stanford University. It includes 994 items of which 49 are videos and 54 are sound recordings. Together, the materials show that the textbook account is even more misleading than we imagined. The startling new evidence tells a tale of the experimenters treating the Guards effectively as research assistants. It reveals how disturbed the Prisoners were when Zimbardo told them they could not leave the study. It raises profound intellectual, moral and even legal questions about what went on in that Stanford basement in the summer of 1971. The most thorough analysis of the archive, by French author Thibault Le Texier is labelled Histoire D’Un Mensonge – which translates to “History of a Lie”. However, even if Zimbardo’s account of what happened in the SPE is, at best, economical with the truth, that still leaves the question of why some of his Guards turned brutal. We have had the same burning question since we tried to replicate aspects of the SPE in the BBC Prison Experiment some 20 years ago and found that participants were most reluctant to adopt their assigned roles. There are clearly many reasons why a research finding might fail to replicate. But we had always suspected that Zimbardo’s unusual leadership role in the SPE was central to understanding the results of his study. And in this respect, one item in the archive – a recorded meeting between Zimbardo’s Warden, David Jaffe and a ‘reluctant’ Guard, John Mark – proved to be conclusive, offering hard evidence that our suscipions were right. But you don’t need to take our word for it – we strongly advise that you listen to the tape and decide for yourself whether this supports Zimbardo’s argument that Guards slipped naturally into role, or whether it supports our argument that leadership was necessary to turn the Guards into brutes. We suspect that, after hearing the tape, you will never think about the SPE in the same way again. We suspect that you will also see how important it is for the experimenters to acknowledge their role as the leaders of a toxic social system. But just to make sure, we are currently writing up our analysis of the Jaffe-Mark meeting for publication in an academic journal to highlight the importance of an identity leadership analysis of the SPE. The tape joins other evidence which indicates that the experimenters intervened to shape the study more than they acknowledged. For instance, there was video evidence of Zimbardo addressing his Guards before the study started. Then there were letters, magazine articles, interviews with past participants and Zimbardo’s associates (notably his ‘consultant’ Carlo Prescott) which made stronger claims about intervention. But they were little more than hearsay, rumour. Until now, these seemed of inadequate weight to overturn one of the ‘monuments’ of our discipline. Zimbardo could swat them away like gnats on the back of an elephant. But the new evidence from the archives will finally allow readers to listen to the evidence themselves, rather than rely on the experimenter’s story. How has Zimbardo responded this time? By reasserting that 'none of these criticisms present any substantial evidence that alters the SPE’s conclusion'. And at the same time that he berates his critics (without engaging with their arguments), he reworks his story to now say that, yes, Guards were told to be tough, but not how to be tough. For Zimbardo, then, this is all just fake news. Except that it plainly isn’t. This might have worked in the past, but now the necessary evidence is available to anyone who wishes to spend a few minutes listening to it. There is no longer any excuse for repeating a story which is so deeply flawed. We need to get busy rewriting our texts and revising our lectures. EDITOR'S NOTE: A different version of this letter was published in the August print edition, under the headline 'Breaking free from Stamford'. You can find this in the PDF version below. UPDATE: A joint statement from Reicher, Haslam and the SPE researchers. Griggs, R.A. (2014). Coverage of the Stanford Prison Experiment in introductory psychology textbooks. Teaching of Psychology, 41, 195-203. `Time to change the story' or `Over-stating the case'? I write in response to the letter in the August 2018 Psychologist as authored by Professors Steve Reicher, Alex Haslam and Jay Van Bavel, entitled `Breaking free from Stanford’, which iterates similar points as made in the online article here. I submitted the text (as below) of my comment on this letter to the editor of The Psychologist at the end of July 2018. Since then a joint letter by Haney, Reicher, Haslam & Zimbardo has been published in the October 2018 issue, expressing a welcome coming together of views. The editor in the meantime recommended I lodge my comments here. I am doing so now because I think that arguments and representations made in the August letter have not been addressed and should be, given various considerations which I outline below. I think my comments bring into question whether it is really `time to change the story', as has been argued above in this online article and in the August letter. 1. Much is made in Reicher et al. 's account of the SPE Warden’s attempt to persuade one guard, John Mark, to act in a tougher way. The authors then write `the tape shows conclusively that the experimenters did not leave the participants to their own devices’ i.e. they designate `participants’ – plural, yet the evidence is only in relation to the singular i.e. for John Mark. Thereby, this is an over-generalised observation. Further, the authors do not say what effect, if any, this intervention had on John Mark – when I listened to the recording he did not sound like he was going to change. It sounded to me as if the SPE Warden’s intervention was ineffective. Further, the authors of the letter do not designate what evidence there is to show that the Warden’s intervention made a difference to John Mark’s behaviour thereafter and whether this acted as a catalyst for cruel treatment of the prisoners. Nor do they provide evidence that the same interventions were made with other guards and had a tangible effect on their behaviour toward the prisoners. Rather Reicher et al appear to assume this was the case. 2. Following on from (1) above, I do not think what has been provided constitutes `dramatic new evidence’ (para 2) or `startling new evidence’ (para 5). Rather, such language appears disproportionate. It is unlikely to promote a calm and objective appraisal of `new evidence’. 3. In the letter it is stated that `…evidence from the SPE was never actually published in a peer-reviewed psychology journal’ but the letter omits to mention that the SPE findings were published in 1973 by Haney, Banks and Zimbardo in the International Journal of Criminology and Penology; hence this omission I think is misleading. 4. The letter then goes on to say in the same sentence `…methodological details of the study were also not in the scientific domain’; this is not the case, given the 1973 publication by Haney, Banks & Zimbardo in the International Journal of Criminology and Penology, which contains a Method subsection which starts on page 72 and ends on page 77, with a further 3-4 pages on data collection, before reporting of the Results beginning on page 80. So, there are circa eight pages of methodological details in the 1973 journal article, far more than the average. 5. Much is made of the word `natural’ in the letter and reference to Zimbardo saying that `participants simply slipped `naturally’… into their roles’. However, the authors do not cite the reference or the context from which this quotation comes. In fact the line comes from the 1973 article by Haney, Banks and Zimbardo in Naval Research Reviews in which it is used once. The whole sentence from page 12 of that article is: `Thus, guard aggression was no longer elicited as it was initially in response to perceived threats, but was emitted simply as a “natural” consequence of being in the uniform of a “guard” and asserting the power inherent in that role’. So, the sentence and the use of the word `natural’ is being deployed with reference to a perceived change in the way in which guards were responding in particular circumstances of the prison (as is made clear earlier in the paragraph) and is not used as a cover-all explanation of guard’s behaviour generally within the simulated prison as a whole, as Reicher et al imply in paragraph 2 of their letter and later on at the top of page 2. 6. Reicher et al say that `how important it is for Zimbardo and his research team to acknowledge their role as the leaders of the toxic social system that developed’. They say this with their BBC-PS derived `leadership’ explanation in mind. Yet, as is known, Zimbardo did acknowledge his role as leader of the prison, as the `superintendent’, (and also of the experiment, and of thereby conflating the two roles - which he regretted), as stated in the 1993 interview I conducted with him for The Psychologist. The letter implies he does not acknowledge this role whereas in fact he did so previously. So, overall, I do not think Professor Reicher et al's letter is a balanced response to the new evidence re the SPE and is over-stating the case for an overhaul of current understanding. I do not see their `leadership’ based explanation as derived from BBC-PS as antithetical or mutually exclusive to the role-conformity explanation as derived from SPE. These explanations are two parts of the one whole. Nor do I think one explanation is better than the other – the latter I see as a non-argument. Both SPE and BBC-PS broaden our understanding of the importance of social influence and identity processes in the genesis of human behaviour. Department of Psychological Sciences, School of Psychology, University of East London, E15 4LZ. Haney, C. Banks, C. & Zimbardo, P. (1973). Interpersonal dynamics in a simulated prison. International Journal of Criminology and Penology, 1, 69-97. Haney, C. Banks, C. & Zimbardo, P. (1973). A study of prisoners and guards in a simulated prison. Naval Research Reviews, 1-17. McDermott, M.R. (1993). On cruelty, ethics and experimentation: Profile of Philip G. Zimbardo. The Psychologist, October, 456-459.